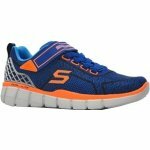 Skechers Final Challenge 97383 boys velcro fastening trainers. With imitation, elasticated laces, mesh uppers and vibrant detailing, this style is not only comfy and practical, but also very eye catching! The air cooled memory foam keeps feel feeling fresh, whilst also providing all the comfort you need. Velcro fastenings allow for a secure, yet adjustable fit.